Packing tip #1: Learn how to layer! 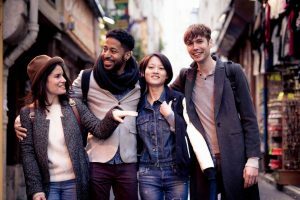 One of the biggest advantages of joining a group travel program like AESU is that you have the opportunity to visit several different countries, cities, and time zones in one action-packed trip. Traveling from foggy London to sunny Greece in a span of three weeks is a thrilling adventure, but it can present a few issues when packing one suitcase is involved. Fret not, and discover four packing hacks for visiting multiple climates in one trip! Before you throw a parka and a bikini into your suitcase, take the time to research the journey ahead. What time of year will you be traveling? What specific areas will you visit? For example, Iceland is known to be cold, but the summer temperatures can climb well into the 80s in some regions. Having a firm understanding of the climates you’re visiting will help you save inches of space in your suitcase. When it comes to packing for cool and warm climates, layering is your best friend. Don’t think of your cold and hot climate clothes as separate wardrobes. Instead, consider how the pieces will work collectively. If you have to choose between two sweaters, select the one that will best match your heavy jacket. If you have several dresses, pack the ones that will look best under a coat or long-sleeved shirt. If you’re traveling from a warm to a cold climate, don’t try to fit a bulky parka into your suitcase. Purchase a down jacket designed to pack into small spaces. Not only do down jackets provide an incredible amount of warmth, but they have been specially created to travel easily. For backpackers, packable down jackets are the go-to choice for cold-weather adventures. Packing organizers, like packing cubes, now make it easier than ever to fit more into one suitcase. Not only will you be able to pack your favorite outfits into your checked luggage, but you can maximize space in your carry-on as well! This entry was posted on Wednesday, May 9th, 2018	at 11:00 am	. You can follow any responses to this entry through the RSS 2.0	feed. Both comments and pings are currently closed.